Visiting Japan for the first, second or even third time can be scary. It is not an easy task to get around in Tokyo or figure out what to see from the countless number of giant temples, beautiful parks, large shopping streets and fresh restaurants. That is why we have prepared our top “7 days in Japan” itinerary and recommendations so that you can travel, see and explore the greatest sights of the country with your Japan Rail Pass. Refer to our three days in Tokyo article for more detailed information on how and where to exchange your Japan Rail Pass, take the Narita Express (or the Tokyo Monorail from Haneda) and arrive at the city center of Tokyo. Start your trip off by visiting Odaiba, one of the newest, most vibrant shopping and entertainment centers of Tokyo. 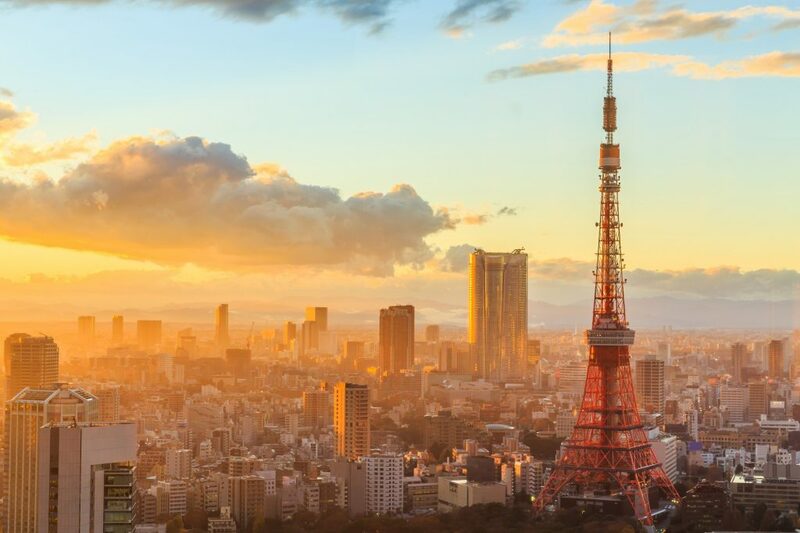 While there, take advantage and visit the Tokyo Tower, a communication station, which is known to be the Japanese replica of the Eiffel tower, offering fantastic views of the city from above. Escape from the busy Tokyo life visiting Hama Rikyu, a small but lovely park, offering beautiful walks among 300-years old trees and curious pond fish. And for a piece of history, the remarkable Edo-Tokyo Museum is the place for children and adults to discover the past of Japan, specifically focusing on the Edo period between the 1603 and 1868. 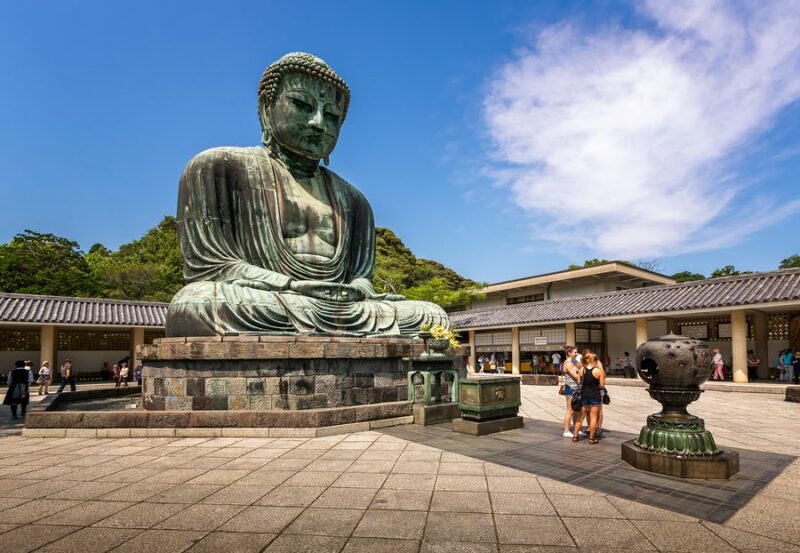 Just an hour away from Tokyo, the Kamakura region has plenty to offer. You can get there with your Japan Rail Pass, by taking the Tokaido Line from Tokyo Station and making one connection at Totsuka Station, by changing to the Yokosuka Line, until you arrive at Kamakura Station. 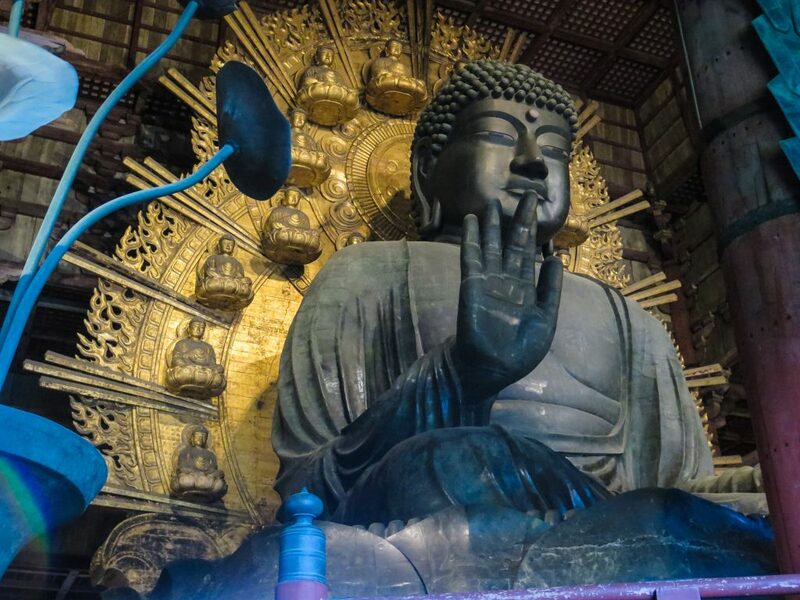 The Giant bronze Buddha statue – located on the lands of the Kotokuin temple, it is the second largest Buddha in Japan. It is 13,35m tall and originally built to stand within the grounds of a 13th-century temple. However, natural disasters have destroyed the temple more than once, so the locals decided to let it stand in the open air. Zeniarai Benten Shrine – a magical place, where people (local as well as foreigners) go to wash their money. This means not money laundry but a spiritual experience, a place where the saying goes that whatever you wash in the shrine’s spring, it will double. The Kamakura Beaches – whether you are going in the summer and wish to experience the cultural difference between your home beaches and those of Japan, or you are visiting in the autumn/winter seasons, you shouldn’t miss on the sandy cost Kamakura has to offer. 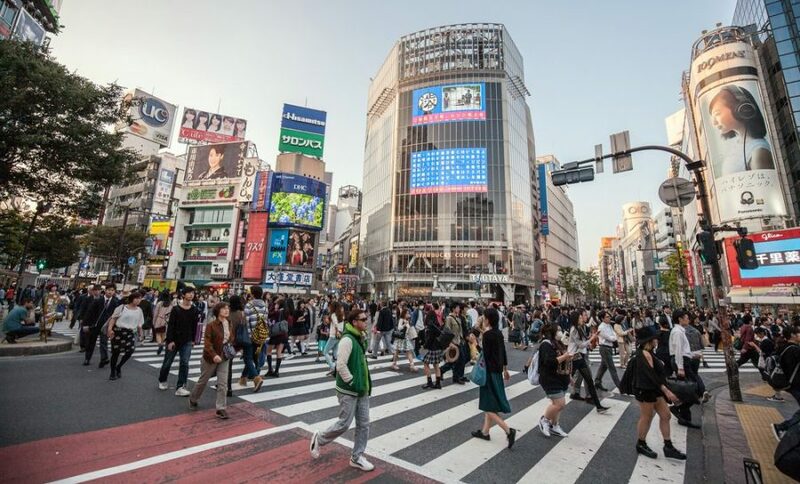 The Shibuya Crossing – the number one most famous place in all of Tokyo. Despite the endless amount of crowds, crossing the traffic lights every minute, people are attracted to Shibuya with the desire to experience what being a part of Tokyo means. Yanaka – Just a 40 minute ride away (take the Yamanote line), Yanaka will fascinate you with its fully reconstructed temple, narrow streets and tiled-roof houses. Yanaka is not the most touristic place, which makes it perfect for a peaceful walk, filled with history and past stories. Ueno – Within walking distance from the Yanaka area, the gorgeous and never-ending Ueno area includes the Ueno Park and Zoo, Tokyo University of Arts, National Museum of Nature and Science, National Museum of Western Art, Tokyo Metropolitan Art Museum, Tokyo Bunka Kaikan concert hall and more. 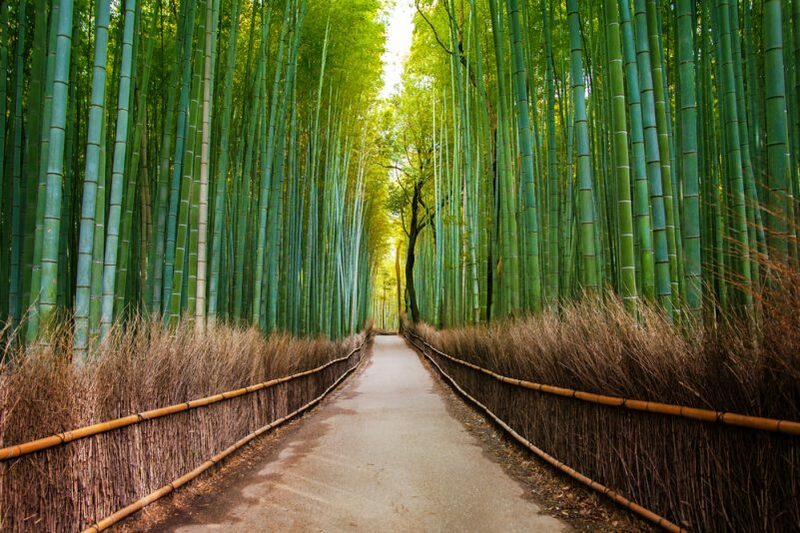 Arashiyama Bamboo Grove – Conveniently located at just ten minutes walking distance from the Saga Arashiyama Station (JR Sagano line), the bamboo grove will take you deep into the wonderland of this magical forest. Perfect for a romantic escape or just a quiet walk with you family and friends, where you will find peace and serenity. Monkey Park Iwatayama – For nature and animal lovers, this will be your one and only – breathtaking views from the top of the mountain (just a 20min walk up). You can freely go around the area, where monkeys live and play. It is safe to give them food and watch how mothers and their little ones walk around and study you, just like you are studying them. Tenruy-ji temple – a world heritage site, this is one of the most beautiful Zen temples in Kyoto, especially during the cherry blossom season (last week of March – first week of April). The gardens are even more gorgeous with the surrounding rising mountains, located to their north. A spectacular view, especially when the sun rises. Check out our article Arashiyama Bamboo Forest and district for more details. Nanzen-ji – This Zen temple is just like the very perfection of Japanese temples. With its Zen gardens, giant entrance doors, and some smaller temples, the Nanzen-ji has everything there is to offer to the Japanese culture lovers. 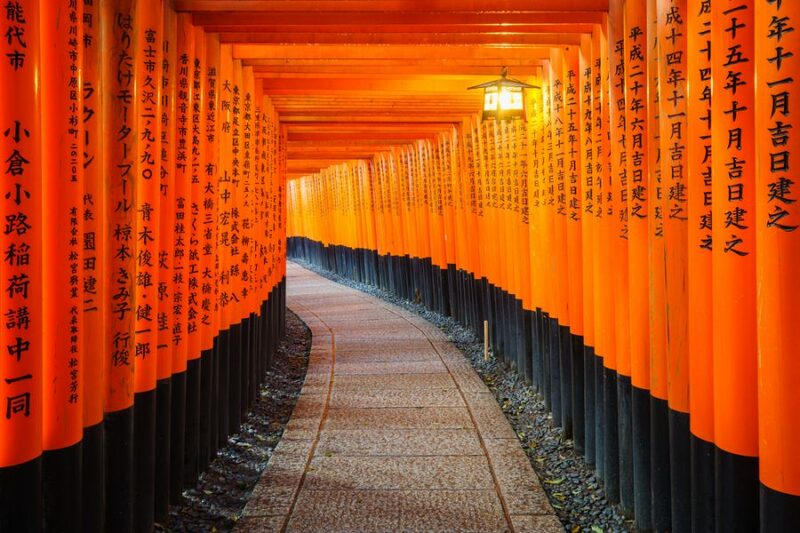 Fushimi Inari-Taisha – The thousands of vermillion torii gates are some of the most photographed in the area and one of the greatest places in Kyoto. The Japanese come to this site to pay their respects or to pray for good fortune and success. Kinkakuji (the Golden Pavilion) – A different Zen temple with top floors covered in golden leaves. Visitors are not allowed to the first floor of the building, where historical Buddha statues lay. However, the windows on this floor are usually open, so tourists can look through and enjoy the ancient ambiance of the temple. Close to the exit, you can sip on traditional tea and tasty treats. Take the JR Nara Line from Kyoto Station for less than an hour journey to Nara – the first permanent capital of Japan and one of the few cities packed with so much cultural heritage. Isuien Garden – Gorgeous ponds fed by the nearby river meet and give life to the incredible nature surrounding the gardens, making you feel welcome and at peace. Isuien has actually two different parts, each offering tea houses and authentic Japanese atmosphere. Todai-ji Temple – The all-time Nara and Japan-must-see! Home of the Great 16 meter tall Buddha (Daibutsu) this temple will leave you breathless, while you are walking by the marvelous architecture of the building, which seems to be part of the skyline due to its immensity. Hōryū-ji Temple – Do not miss out on some of the oldest surviving wooden buildings in the world! Founded by Prince Shotoku in 607, this temple was announced world heritage in 1993. Many might miss out that this was built in the ancient times, while Mohamed was alive, the Mayan calendar was being written, the Roman Empire had just fallen, and meanwhile the Japanese were building wooden structures that would stand still centuries to come. Take the Shinkansen train back to Tokyo and get ready for your trip back home. Depending on your schedule, you can check out the districts of Asakusa and Harajuku, the first stops on our 10-day itinerary and 14-day sample itinerary. Otherwise, you can say goodbye to the city with the views from the top of the Metropolitan Government Building in West Shinjuku. Note: Do not forget that your can use your Japan Rail Pass to take the Narita Express or the Tokyo Monorail to Haneda airport for free. Make sure to reserve your seats before boarding! Will I be able to take the shinkansen on May 6? I read something online that the train is not available on Apr 27- May 6 and I won’t be able to ride the train on those dates. Please confirm that I will be able to leave from Tokyo to Osaka on May 6 with the shinkansen using the JR pass. Thank you for your help. Hi Angie! 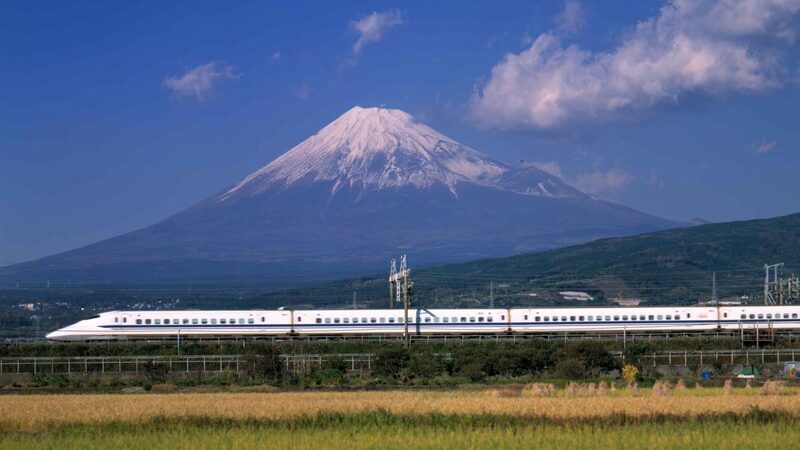 During the Golden Week, which makes 10 bank holidays in the country, Shinkansen bullet trains will still be working since there will be more people than usual travelling around the country. Happy travels! How do I go from Tsuruhashi station (in Osaka) to Nara using my JR pass? Hi Fernando! First you will have to reach JR Osaka Station and once there take the Yamatoji Rapid Train to JR Nara Station. These trains run once per hour; the trip lasts around 45 minutes and is covered by the JR Pass. Happy travels! My husband and I are traveling to Japan for his 30th birthday on May 27th. After reading several comments I am still a tad confused. I want to purchase the 7 day JR pass, however, I am confused on what it entails. If I purchase the 7 day pass are we on the train for 7 days straight? Or do we get on the train in the morning and go home(to our hotel) each night? Also, does this pass also work for the smaller metro stations for touring locally around the city of Tokyo? Or any other major cities? Please help! Thank you! Hi Mrs. Grimes! The Japan Rail Pass is a multi-use all-you-can-ride discounted rail ticket. It gives you unlimited access to all Japan Rail National trains, as well as JR bus services, ferry services, and airport transfers. Happy travels! We are going to Japan this coming May for 6 days, is there a JR pass for 6 or 5 days only just to cover the days that we are in Japan. Hi Mahalia! A Japan Rail Pass can be valid for either 7, 14 or 21 consecutive days and hence you wouldn’t be able to purchase a pass of a different duration. Please note the Japan Rail Pass is the biggest discount on public Japanese transport available and usually even when one travels less days than pass it still pays off. Happy travels! From Tokyo -> Hiroshima -> Kyoto –> Tokyo on a 7 day rail pass. – From Tokyo to Hiroshima: You can use your JR Pass to take the Tokaido Shinkansen line’s Hikari bullet train from Tokyo Station to Shin-Osaka Station, Shin-Kobe Station or Himeji Station. Once in one of these stations, you can transfer to the Sanyo Shinkansen (Sakura train) and arrive in Hiroshima at Hiroshima Station. – From Hiroshima to Kyoto: Kyoto and Hiroshima are connected by the Tokaido and Sanyo Shinkansen lines. You can use your JR Pass and the journey between Kyoto Station and Hiroshima Station. – From Kyoto to Tokyo: You should take the Shinkansen Hikari bullet train from Kyoto Station and arrive at either Tokyo Station or Shinagawa Station in central Tokyo. my 2 sister and i are planing to visiti nagoya -tokyo-hokkiado this may. can you helpy me the cheapest transportation from nagoya-tokyo-hokkaido? our travel date is may 28-may 5 flight mnl-nagoya & Sapporo-manila :). Hi Joy! In your case even when you are just making 2 big trips a 7-day Japan Rail Pass would be cost effective. Nagoya to Tokyo already costs 10,500 yen and Tokyo to Sapporo (in Hokkaido island) 26,500 yen. A 7-day Japan Rail Pass costs 29,110 yen which is less than the 37,000 yen you would pay in individual tickets. In addition, when you start factoring in the money you would spend on the metro, buses, transfers, and ferries, then the savings become a must. Happy travels! 1. How much would our budget be for all these OR for some of these? Our budget is between big savings and comfort as well. So please send us some options. 2. Among those places, what can we afford to miss? We are first-timers. Thanks so much! We look forward to your response. Hi Lissie! We recommend you to contact a travel agency. We only have details on Japan Rail Pass cost and thus are unable of providing costs for different itineraries. We would like to recommend you to check our article How much does it cost to go to Japan? in case it is of help. Happy travels! Hello! Can someone help me know which stations to travel? We are going from Tokyo -> Hiroshima -> Kyoto – Tokyo on a 7 day rail pass. Also, 9 of us travelling but my one daughter is on student exchange which means she has a student visa. I just read she is not eligible. Now I am in a bit of a panic – what do I do for her? Hi Kristin! As you have read, the Tourist Visa is the only visa which allows you to obtain and use the Japan Rail Pass. We recommend you to purchase individual tickets for the person that is not eligible for the pass. Happy travels! We are travelling to Tokyo and staying there for 4 nights (July 10-14). We plan to visit Tokyo, Mt. Fuji and Kyoto (including major tourist sites and nara) by using Japan rail pass as our main means of transportation. Any suggestions on the train stations and if there are any other passes we need to purchase in conjunction with the JR pass. Hello we are traveling to Japan In July arriving in Tokyo July 9th and leaving July 17th out of Tokyo. I am thinking we will do Tokyo and Kyoto as home bases but def want to visit the Mt. Fuji region. Where is it easiest to do a day/overnight trip from? Also looking for must see sights on our 7 day trip and the most economical way to do that using the pass. Hi Bronislava! It will be easier to visit the Mount Fuji area from Tokyo. Hi Team! We’re going to travel in Japan for 9 days and our target places are in Chubu area, Osaka & Tokyo. Can we use it in those places? Are there connecting lines in each of it? Are target places in Chubu are Aichi, Shizuoka, Gifu & Nagano. What is the best option? Hi, we’ll be in Japan for 7 nights flying into and out of Tokyo Narita, and we just bought the JR Rail Pass. We are considering the following itinerary options. Which would you recommend? Or something else? 2. Same as above but 4 nights Kyoto and we won’t visit Hakone on this trip. Hi Greg! Our best tips for a 7-day trip around Japan is the one described in this article. Japan is a huge country but we believe you can get a good taste of it! Hello we are going to travel to Japan on May 27 Arriving at Narita Airport and depart Japan on June 4 , 2018 via Kansai Osaka airport. I plan to visit Hakone Mt Fuji, Kyoto, Tokyo, Osaka and what some other places Iyou can recommend if I will buy Japan rail pass is it Fitted in my etinerary if not What Pass can u recommend. I will be staying 3 night in Tokyo( May 27 to 30 ) and 3 night in Osaka ( June 1 to 4) . Im still in the decision making if Where Im gonna spend my 2 nights ( May 30 and 31). I need advice Thank you in advance. Since you are staying longer than the travel period stated in this article we recommend you to check the followig: 10 days in Japan: Travel itinerary. There you will find our best recommendations to get to seize your Japan Rail Pass while discovering the whole country in 10 days. Our family of 5 is traveling to Japan in April and looking for your advice for the most efficient use of our pass and best time to cover cherry blossom season. We are purchasing a 7 day Green pass. Planning to stay for 3 nights in Tokyo with possible day trip to Nikko, 3 nights in Osaka with day trips to Kyoto, Nara, and Himeji and 1 night in Odawara / Hakone to see Mt. Fuji. We are arriving to Narita on April 2 around 4 pm and flying out of Narita on April 9 at 5:45pm. You can still see the full bloom in Tokyo (until around April 3rd), and this weekend in Kyoto (until around April 5th). Please keep in mind that most flowers usually take a week to reach full bloom once flowering has begun and that full bloom also lasts around a week. Hello! I will be flying into Narita on May 15 2018, then flying out from Narita on May 20th 2018. I want to see Kyoto during my 5 day visit, was wondering if you can recommend the best way to fit in a trip to Kyoto in a 5 day trip. I plan on purchasing a JR Rail pass and will rely heavily on public transportation throughout my trip. Travelling between Tokyo and Kyoto is extremely easy with the Japan Rail Pass. You should take the Shinkansen Hikari train from either Tokyo Station or Shinagawa Station in central Tokyo, and arrive at Kyoto Station. A standard Tokyo to Kyoto trip with the JR Pass takes close to 1 hour and 40 minutes taking the Hikari Shinkansen so it should be easy to include a day trip to Kyoto. For some great suggestions and recommendations on which places to visit and what to do in Kyoto, check out our Japan in 14 days (day 4-6) article. I am travelling with my parents (in early 70s) together with my 2 siblings to Tokyo on Feb 25, 2018. We plan to go places on our own (without tour guide) so we can visit places on our own pacing exploring Tokyo. Initially, I wanted to stay the whole 7 days in Tokyo. But if I’m going to buy the JR Pass East, we might as well visit Nagano or Niigata to experience the cold Winter (will it still be cold?). OR can we just visit Mt. FUji and still have the Snow experience? How do we go to the local places? Do I need to buy tickets for taking local bus transpo or does the JR Pass covers it. I hope you can help to give more recommendations. Any recommendation on my earlier email? The way to both Nagano and Niigata from Tokyo is included in your Japan Rail Pass. The Hokkaido Shinkansen departs from Tokyo Station and rides all the way to Nagano Station. The Joetsu Shinkansen will take you straight from Tokyo to the Niigata prefecture in just two hours. Those locations are among the preferred visits for skiers and snowboarders so you may get a chance to experience the cold. Mount Fuji will also provide a good snow experience and is accessible almost fully with the Japan Rail Pass too. To get there take JR Tokaido line for Kozu from Tokyo Station, using your JR Pass. Once at Kozu (Kanagawa), take the JR Gotemba Line for Numazu, also included in the JR Pass, and get off at Gotemba Station. Once at Gotemba station, take a bus to Subashiri 5th station (not included in the pass), the gateway to climbing Mount Fuji. I am travelling to Japan for the first time in April/May with my elderly father, we are keen to visit Tokyo, Kyoto (probably via day trip) and Osaka during our 7days in your country. Grateful if you could assist us in navigating the best options for rail travel for our proposed itinerary. We would like to get the full bullet train experience from Tokyo to Osaka (and return) if possible. Can you please also advise if JR / Shinkansen offers discounts to seniors/over 70years? No senior discounts apply to the Japan Rail Pass. However, keep in mind that the Japan Rail Pass prices allow to save up to 62% in individual train tickets. – Transportation from Narita Airport to Tokyo city center in the Narita Express. This same train will take you to Shinjuku Station. – Shinjuku is also part of the Yamanote Line which is probably the most popular and convenient way for getting around Tokyo. – While in Osaka, you will be entitled to make full use of the Osaka Loop Line. I want to use the Itinerary for my trip in March 2018 – can you tell me which lines I should take to make it to the places on the itinerary? You can check the transportation you need to take for your itinerary at Hyperdia – the number 1 Japanese online transportation planning tool. It will enable you to precisely plan your trip in Japan from station to station with punctuality to the second. Thanks for sharing this post. It’s really a big help for us during our last visit in Japan. Would like to ask about the JR Tokyo Wide Pass. It is ¥10,000 & have to use it for 3 consecutive days. May I know which area does this covers? Planning to go to Disneysea, Mt Fuji & Gala Yuzawa using this method. Please advise. All details regarding JR Tokyo Wide Pass are available at JR East official website. Please make sure to visit it to have the most updtaed information. I will be arriving Haneda Airport, what train to take to go to Hotel Mystays Hamamatsucho? We will be in Japan for 7 days, trying to put together a list of all place to visit. Any suggestion? From Haneda Airport you can take the Tokyo Monorail, covered by the Japan Rail Pass, to central Tokyo. Once you are there you can take any of the JR lines included in the Japan Rail Pass that take you around the city: the Yamanote Line, the Keihin-Tohoku Line, the Rapid Chuo Line, the local Chuo-Sobu Line and other metropolitan lines that circulate on the outskirts of the city such as the JR Keiyo, Musashi, Nambu and Yokohama lines. Just make sure to locate your hotel and what lines take you there! Our best recommendation for a 7-day trip in Japan is available in this article you have already read. We recommend you to further surf our blog if you want to get further insight on what to see when you are in Japan. I will be in Japan for 7 days ( November 15th – November 21st 2017) ( party of 3 ). We would like to visit Kyoto & Tokyo using Japan Rail Pass. You can visit first any of the cities since it makes no change – just plan your trip as you prefer. If you travel with a Japan Rail Pass you are entitled to transfer from Narita Airport to Tokyo and also from Kansai Airport to Kyoto at no additional charge, as well as to travel between Tokyo and Kyoto unlimitedly. This is my itenerary for Japan…. I want to purchase a 7 day rail pass, but when do you think it makes most sense to use up the 7 days considering I will be in Tokyo for 10 days….see below itenerary. I would rather save the 7 days for when the costs will be highest. Any advice? – From Narita Airport you can take the Narita Express to central Tokyo at no additional cost. – Once you are in Tokyo, you can use several lines within the city: the Yamanote Line, the Keihin-Tohoku Line, the Rapid Chuo Line, the local Chuo-Sobu line and other metropolitan lines that circulate on the outskirts of the city such as the JR Keiyo, Musashi, Nambu and Yokohama lines.. However please make sure to check which parts of the city you want to visit since most likely you won’t be able to access them all only using your Japan Rail Pass. – Nikko is one of many interesting day trips from Tokyo made possible using your Japan Rail Pass since traveling time is less than 2 hours from Tokyo by train and at no additional charge when traveling with the Japan Rail Pass. – Mount Fuji can be easily reached with the Japan Rail Pass via Gotemba: you just have to take JR Tokaido line for Kozu from Tokyo Station, using your JR Pass; once at Kozu, take the JR Gotemba Line for Numazu and get off at Gotemba Station. – Travelling between Tokyo, Kyoto and Osaka with the Japan Rail Pass is easy. You should take the Tokaido Shinkansen line that connects three cities. – Numerous trains in and around Kyoto can be accessed using your Japan Rail Pass. – While in Osaka, you will be entitled to use the Osaka Loop Line at no additional cost if travelling with the Japan Rail Pass. – Last but not least, to get from Osaka to Kansai Airport you can take the Haruka Express, also included in the Japan Rail Pass. If you want to check the costs of each individual trip to make your decision you can check Hyperdia – the number 1 Japanese online transportation planning tool. It has the most updated and useful information you can get. Hello, confirmed our trip to Japan from Jan. 1 to Jan. 6. Jan. 4 – Kyoto (doing a Ryokan for 1 night). Is it better to do the Ryoan in the Mt. Fuji area? Will the JR pass be able to cover all the routes mentioned above? Do we need to stay overnight at Mt. Fuji and do the Ryokan there or is it better to do a day trip to Mt. Fuji area and do the Ryokan at Kyoto coming from Mt. Fuji? Also, is it better to buy the JR pass here in the US now than getting it close to our travel date or getting it there perhaps? Any recommendations or suggestions for this short trip? Looking forward to your response. Thank you! Yes – the Japan Rail Pass will cover all of your trips. – To get to central Tokyo from Narita Airport you can take the Narita Express at no additional charge. – Within Tokyo there are some lines you can use to explore the city, such as the Yamanote Line, the Keihin-Tohoku Line, the Rapid Chuo Line, the local Chuo-Sobu and other metropolitan lines that circulate on the outskirts of the city such as the JR Keiyo, Musashi, Nambu and Yokohama lines. – Mount Fuji can be scheduled as a day trip from Tokyo since it should be only a little over 2 hours from Tokyo. Regarding where to purchase the Japan Rail Pass, it would be adviceable to purchase it in advance. The JR Pass can be purchased online or through specialized agents, like this website. However, since March 8, 2017, and on a trial basis, the pass is also sold at selected stations inside Japan, at an increased cost. While you are now able to purchase the JR Pass in Japan, please keep in mind that it is only sold in particular stations, at a higher price and you are required to pay in Yens, as no other currency will be accepted. Thank you so so much for your prompt and very detailed and helpful reply. We highly appreciate your assistance. May I ask another question. Since my daughter shall travel further to Hiroshima and Nagoya after Tokyo-Osaka, we wish to ask you if she can use JR pass for traveling from Osaka to Hiroshima, and then from Hiroshima to Nagoya, and finally from Nagoya to Tokyo? If the answer if affirmative, we will get her a 14 day JR pass. Again, thank you so so much for your assistance and we look forward to hearing further from you in due course. – To get from Osaka to Hiroshima, from the city center, take the JR Haruka Express to Shin-Osaka Station, then transfer to the Sanyo Shinkansen line (westbound, Hikari trains). This trip takes approximately 2 hours and 40 minutes. – From Hiroshima to Nagoya she will need to take the Shinkansen Sakura in Hiroshima to Shink-Kobe station. Once there she will need to transfer to Shinkansen Hikari until she gets off at Nagoya. – And last but not least, to go from Nagoya back to Tokyo the quickest option would be taking the JR Tokaido Shinkansen, accessible using your JR Pass. Remember you can purchase your Japan Rail Pass here. We plan to visit Tokyo-Osaka areas for 10 days. We arrive Tokyo (Narita airport), stay in Tokyo for 3 days and then move to Osaka and then back to Tokyo-Narita airport. Whuile in Osaka, we plan to stay in Osaka and make one-day round trips from Osaka to different places like, for example, Osaka-Kobe, Osaka-Kyoto, Osaka-Nara/Nagoya/Hokune. Day 1 (11Aug): Arrive Narita Airport and to Tokyo city – no JR pass used. Day 2&3 (12 & 13Aug): Sightseeing in Tokyo – no JR pass used. Day 4 (14Aug): Travelling from Tokyo to Osaka (Shinkansen) – IR pass used. Day 5 (15Aug): Going to Kyoto (Mt. Fuji, etc…. )and back to Osaka (one day trip). Can we use JR pass on this route? Day 6 (16Aug): Going to Kobe and back to Osaka. Day 8 (18Aug): Travelling around Osaka: Universal Studio Japan in Osaka. Day 8 (19Aug): Sightseeing in Osaka. Day 9 (20Aug): Travelling back to Tokyo from Osaka (Shinkansen). Day 10: going home from Narita. In Osaka, we stay in walking distance from Nipponbashi station. So do you think our plan would work? Can we use JR pass for travelling/sightseeing in Osaka, for going to Kyoto, Kobe as I plan? Thank you so much for your assistance and I look forward to hearing from you soon. – Going from Osaka to Kyoto and back is fully covered by the Japan Rail Pass. Travelling between Kyoto and Osaka is now easier than ever. Just take the Hikari train on the Tokaido Shinkansen line. You will get between Kyoto Station and Shin-Osaka Station in less than 30 minutes! – If you plan to visit Hakone area (Mount Fuji) from the Kansai region (Osaka and Kyoto), you will have to take the Tokaido Shinkansen (Kodama and some Hikari trains, please check) from Kyoto Station or Shin-Osaka station (covered by the Japan Rail Pass) and get off at Odawara station. Then take the Hakone Tozan train for Hakone-Yumoto Station (not covered by JR) and finally get off at Hakone-Itabashi Station. – To go from Osaka to Kobe you have two options, both fully covered by the Japan Rail Pass: you may take the Sanyo Shinkansen from Shin-Osaka Station to Shin-Kobe Station. This trip lasts approximately 15 minutes. Alternatively, you may take a JR Special Rapid Train from Osaka Station to the Kobe Sannomiya Station, with a trip duration of around 20 minutes. – To travel within Osaka city you can use the Osaka Loop Line that circles through downtown Osaka. – To get to Universal Studios Japan from Osaka Station, take the Osaka loop line to Universal City Station. From Nishikujo Station, you can also take the JR Sakurajima line (also called Yumesaki line). The park is a five-minute walk from the station. This trip is fully covered by the Japan Rail Pass. – To go from and to Narita Airport you can use the Narita Express, covered by your Japan Rail Pass. Hai.. We are planning to explore japan in this winter for 14 days.. From sapporo to tokyo.. If we buy the jrails pass for 14 days, can it cover all of the transportation from sapporo until tokyo? Are we just need to take a shinkasen to go to hokkaido from tokyo? To go from Sapporo to Tokyo you will need to take the Hokuto limited express in Sapporo and go all straight to Shin-Hakodate-Hokuto. Once there you will have to transfer to the JR Tohoku/Hokkaido Shinkansen that will get you all straight to Tokyo. This trip is fully covered by the Japan Rail Pass. Hello.. just booked my flight from Mumbai to Tokyo and returning from seoul to Mumbai to celebrate New year.. I will be spending 7 nights in Japan.. I will be traveling with my wife and 1 year infant daughter.. I indent to cover Tokyo, Kyoto, mt Fuji.. I thought to spend New year Eve in Kyoto .. kindly advise your views on my plan.. also let me if I have JR pass I still need to reserve seat if yes than what is the procedure to do that.. I also indent to do some scenic train trip in your country.. Your trip sounds awesome! When travelling with the Japan Rail Pass you will still need to reserve seats (free of charge). To reserve your seat, please go to any Ticket Office (Midori-no-madoguchi), located in all Japanese train stations. The kind Japanese staff will ask for your Japan Rail Pass, which allows you to book seats for free. State your destination and preferred departure time and let the staff member find the best option for your trip. From February 2017, passengers can make seat reservations online for certain trains at the JR East Train Reservation Service. After arriving in Japan, passengers can collect their seat reservation tickets at their chosen location. These include designated JR East and JR Hokkaido stations and JR travel service centres and information desks, as well as JR West Kanazawa and Toyama stations. Planning to go to Tokyo (handeda) mid November for 6 nights and 3 night to Kyoto. Then exit at kansai airport. Is it advisable to get the 14 days JR pass? It will always depend on the trip you schedule. The Japan Rail Pass will make your journey easy and it will for sure cover all the mentioned trips: from Haneda you can take the Tokyo Monorail to and from Hamamatsucho Station, on the Yamanote line in central Tokyo; while in Tokyo you will also be able to take advantage of certain JR lines within the city as well as within Kyoto and to reach Kansai Airport through the Haruka Express. Besides this the Japan Rail Pass will be more convenient the more you travel so make sure to plan your trip in advance to assess how to get the most out from your trip in the country. Is there a map or a list of all the routes available throughout Japan with this pass? Hi there is a specific JR pass Tokyo which is cheaper than the JR pass 7 days, do you have it? Or could you tell us more about it? Japan Rail Pass is only available for trips around the whole country. Besides it you can also find regional passes and special passes within the main cities. Hello we just purchase online 7 jrpass. We will arive on the 14th of june. No tour guide just on our own. Family of 3. We want to visit tokyo disneyland on day 1, disneysea on day 2, then go to osaka universal studio on day 3, then kyoto day tour on day 4, then day 5 mount fuji tour and also day tour in hokkaido on day 6 then the abashiri ice wonderland tour on day 7. Or can you advice us on which place to go from our first day to the seventh day in such a way that we encompass the 7 places i mentioned above. To get to Tokyo Disneyland you can use your JR Pass to travel from Tokyo Station to Maihama Station, on the JR Keiyo line. Travel time is 20 minutes and the park is a mere five-minute walk from the station. DisneySea is a twenty-minute walk from Maihama Station in the same route we described before. You can also take the Disney Resort Monorail from Maihama to Tokyo Disney Sea Station. To go to Osaka Universal Studio, take the Osaka loop line from Osaka Station to Universal City Station. The park is a five-minute walk from the station. When in Kyoto you can make full use of the Japan Rail Pass too since local Kyoto JR lines include the Sagano Line and the Nara Line. Mount Fuji can be visited as a day trip from Tokyo by using your pass. I have 2 adults + 3 kids (age 14, 12 and 9) visiting Tokyo for 7 days. If we purchase the JR rail pass, does this pass allows us travel on ALL the subway/metro lines in Tokyo as well? We might do a day trip to Mount Fuji and Kyoto, can we make use of JR pass for our travel? While the Japan Rail Pass does not cover all the metro lines in Tokyo, you can still use it to move around the city. Please refer to our Getting around Tokyo with the JR Pass article for more detailed information. The Japan Rail Pass will also fully cover your trips to Mount Fuji and Kyoto, as well as many other daytrips to cities nearby Tokyo. We’re going to Tokyo tomorrow and need to go to Osaka the next day.. 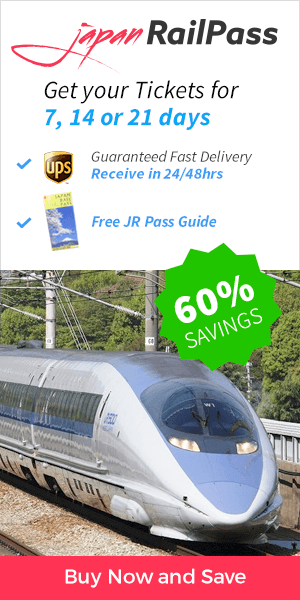 Which line/station do we take and do we have to book a Shinkansen train using JRPass? Is there a train times table I can look at? We have an article dedicated to travel between Tokyo to Kyoto and Osaka with the JR Pass. Make sure to check it and if you need further advice don’t hesitate to write us again. Also making a seat reservation is easy and free of charge for all Japan Rail Pass holders. You can go to any ticket office to make a seat reservation, and in stations like Tokyo Station you can even make a seat reservation at the Exchange counter. I would like to know If I purchase the 21days pass in 1/July used till 16/Jul. then I use again from 1/Aug till 5/Aug. So total is 21days. can I use the pass at this way? Unfortunately, if you purchase a 21-day pass, the validity days will be 21 consecutive days. There is no activation-deactivation-adctivation option. Should you purchase a 21-day pass on July 1, activate it the same day, it will be valid until July 21, at midnight. HI! We are booked on April 29 till May 10 we are 2 senior citizen 5 adults and 1child which is 5 years old. We are planing to stay in toky0 from April 29 to May 4 can you give as advice wheather we use our 7 days past here? or jsut ride the local train in Tokyo is this way can we save money ? coz we are 8 persons..Can you give me a list pls where can we spend our 6 days in tokyo pls..
and from tokyo to osaka is it cheap to buy train tickets going osaka? and what are the best place to see in osaka .. Thanks and hoping for your reply..
For some great advice on what to do in Tokyo in 6 days, take a look at our detailed 3 Days in Tokyo itinerary. Additionally, here are some more ideas on the JR Yamanote line: Getting around Tokyo. The Yamanote line is the central circular line of Tokyo, taking you to many of the city’s prominent places to see. It is included in the Japan Rail Pass. What is more, Narita Express is also part of the JR Pass services. A single ticket from Tokyo to Osaka costs ¥8,750. However, a JR Pass would cover all these costs, which makes for a good overall value for money.